Seventy years to the month after it was written, come and be in the room with Orwell’s last domestic notebook, completed as he battled his way to the end of his dystopian classic Nineteen Eighty-Four. On Tuesday 13th November, UCL Special Collections and The Orwell Foundation are launching a new series of events, offering the public expert insights and unprecedented access to the UNESCO registered George Orwell Archive, the most comprehensive body of research material relating to the author George Orwell (Eric Blair) (1903-1950) anywhere. The first event will take place at UCL’s Institute of Advanced Studies immediately prior to the Orwell Lecture with Kamila Shamsie. 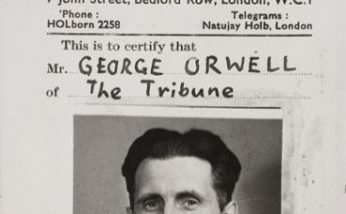 Orwell biographer and Foundation trustee D J Taylor will explore Orwell’s final domestic notebook, which records the authors struggle with his deteriorating health as he rushed to complete Nineteen Eighty-Four. The book was finally published in 1949; Orwell died the next year in University College Hospital (the original building of which happens to be the location of this year’s lecture). Registration for this event is free and guests are warmly invited to attend both the Archive event and the subsequent Orwell Lecture at 18.30. Please be advised that you will need to register for each event independently. You can register for the Orwell Lecture via this page. Since 2016, the Orwell Foundation has been based at UCL, which is also home to the world’s most comprehensive body of research material relating to Orwell, the UNESCO World Heritage registered George Orwell Archive. Manuscripts, notebooks and personalia of George Orwell were presented in 1960 on permanent loan by his widow on behalf of the George Orwell Archive Trust, supplemented by donations and purchases. The aim of the Trustees of the Orwell Archive was to make a research centre for Orwell studies, by bringing together all [Orwell’s] printed works, including newspaper items; private correspondence; other private papers in the possession of his widow; printed matter other than his own which will help later generations to understand the controversies in which he was involved; and tape recordings or written statements by all with first-hand experience of him of any consequence. The Orwell Foundation is based at the Institute of Advanced Studies. The IAS is a research-based community of scholars comprising colleagues and doctoral students from across UCL as well as visiting fellows and research collaborators/interlocutors from the UK and internationally. The IAS is committed to critical thinking and engaged enquiry both within and across conventional disciplinary and institutional boundaries, and aims to provide a creative and generative context in which to question and dislodge habitual practices and modes of thought. In particular, in the context of a major multi-disciplinary university, the IAS harnesses UCL’s extensive expertise across the humanities and social sciences, to investigate received wisdom, to bring the aesthetic and the political into dialogue with one another, to foster collaborative cutting-edge research, to identify and address the urgent ethical and intellectual challenges that face us today, and to confront our responsibilities as citizens of an increasingly contracting and inter-connected world, exploring our place (historically as well as spatially) within it.